Learn about the Smithsonian's first United States National Museum building, now called Arts and Industries, which opened in 1881, and the man who helped shape the Smithsonian’s future, Spencer Fullerton Baird. The United States National Museum, later known as Arts and Industries Building, opened to the public in 1881 with displays of anthropology, art, geology, history, and natural history. 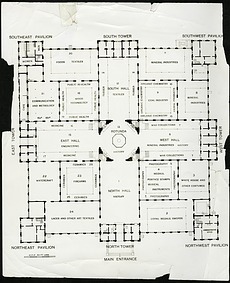 A few of the exhibits, notably birds, invertebrates and art, remained in the original Smithsonian building, or “Castle.” As the floor plan indicates, there were four main halls, north, south, east and west, placed off the rotunda in the center of the building. Ranges ran along the outside walls, and courts were the small sections between the ranges and halls. The pavilions in each corner of the building had second and third floors, as did the towers at the center of each side. The pavilions and towers provided office, laboratory, and storage space for the growing curatorial staff. The main entrance, from the National Mall, was on the north side. In 1897, galleries added a second floor of exhibit space. This National Museum was new in philosophy, as well as building and cases. Credit for this belongs to George Brown Goode, (1851-1896) who became the leading figure in American museum theory and display. Prior to the museum’s completion, he had visited all the major museums in Europe, but then developed his own “democratic” approach. 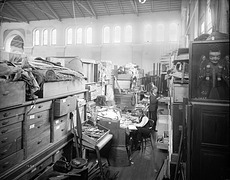 In Goode's view, the early Smithsonian collections had been a museum of research. 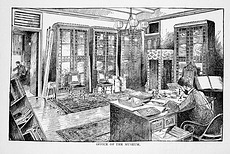 When the Smithsonian accepted the government collections in 1858, it became the museum of record, the “official” repository for objects of art, culture, history and science. Goode’s new museum was also a museum of education. Goode believed that the role of the National Museum was to teach and uplift the citizens of a democracy, not merely amuse or entertain. Goode established a comprehensive classification of the world, from the inorganic to plants to animals to man. The exhibits were designed to convey the place of each object in a great world order. The geology and natural history halls were arranged according to their scientific classification. The anthropology and history of technology halls reflected the prevailing Progressive Era point of view. The curator of ethnology, Otis Tufton Mason, exemplified this approach. He viewed human civilizations in a progression from so-called “primitive” cultures to that pinnacle of development, the United States. Exhibits traced the history of each industry, such as agriculture, ceramics, music, navigation, etc., from “primitive” societies to modern American achievements. A “Historical Relics” collection displayed the possessions of the founding fathers and colonial society. 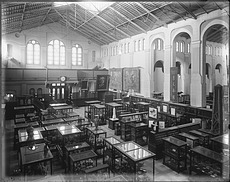 Within the large open halls, exhibits were created by the placement of large mahogany exhibit cases that were on casters and could be moved to reconfigure an exhibit. Goode developed plans for a series of standard exhibit cases that could display a variety of types and sizes of objects. The halls were lit primarily by skylights, with additional light from windows and doors. The windows were frosted to diffuse the direct sunlight on the collections. At its opening, the building had mostly gas lighting; however, some of the small halls also had electric lights hanging from above. By 1883, all exhibit halls had electric lighting. The building had an unusual air circulation system, with the walls consisting of two sections, with a space for air flow in between. The circular openings in the upper wall that can be seen in this picture are the vents to control that air flow and ensure good circulation. 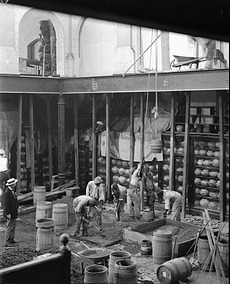 Construction of galleries or balconies on the second floor of the US National Museum began in 1897 and was completed in 1903. The galleries provided additional exhibit space and allowed visitors to look down on the exhibits from above. Construction workers used 15,028 hydraulic pressed bricks to create 67 square feet of gallery space. 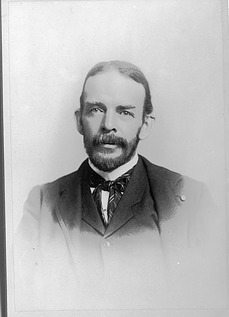 By the time of Baird’s death in 1887, the US National Museum had truly become the nation's museum, with its premier collection of anthropological artifacts, art works, historical objects and natural history specimens. It was a center of art, history, culture, and science that announced that the new capital city was on par with those of Europe. It established a new pantheon of national heroes, distinctly American, and celebrated the triumph of American technology. The National Museum became part of the standard itinerary for visitors to the nation’s capital. The collections grew rapidly in every department, and by the time the building opened, the Smithsonian was seeking funds for a new, larger national museum building.